The book "The Plane of the President" written by the Cameroonian investigative journalist Boris Bertolt plunges into the meanders of a grotesque and incredible affair, one of the biggest financial and political scandals of Cameroon, a case that reveals the true the nature of an autocratic and repressive system, which grinds its best servants. This earned him the worst lawsuits. In August 2001, under the utmost discretion and instruction of Paul Biya, Marafa Hamidou Yaya, Secretary General of the Presidency of the Republic, initiated the process of acquiring a plane for the Head of State. This is a BBJII. A company, GIA International has been selected to serve as an intermediary between the State of Cameroon and the American manufacturer Boeing. While it is question of pouring at first two million dollars so that Boeing can start the construction of the plane, Michel Meva'a m'Eboutou, Minister of Finance decides to transfer 29 million dollars in the accounts of GIA International. The American company will use this money to buy two aircraft that will be rented to CAMAIR led by the son of billionaire Bandjoun, Yves Michel Fotso. In March 2002, the date of delivery of the BBJII, there is no plane or money. 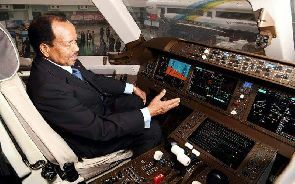 In June 2003, while the plane is sitting in Boeing's workshops and waiting for payment, Paul Biya gives up the acquisition of a BBJII and opts for a 767. Waiting for a new 767 him delivered, Atangana Mebara chose a plane called "Albatros" which was to be rented by the presidential couple. The rest of the case we know. While traveling to attend a summit on the Lake Chad Basin in Paris, the wheels of the "Albatross" struggle to return, Paul and Chantal Biya are panicked.But more fear than harm. Everything will be back in order soon, but Paul Biya will never ride in the Albatross again. Some members of his entourage will say that they tried to kill him.